Lee Michaels is a successful jewelry business with over 100 sales associates across three states. Without a mobile Customer Relationship Management (CRM) solution, Lee Michaels’s sales associates had to rely on handwritten, bulky binders and sticky note-laden notebooks to log customer information while walking through the showroom floor helping their customers. 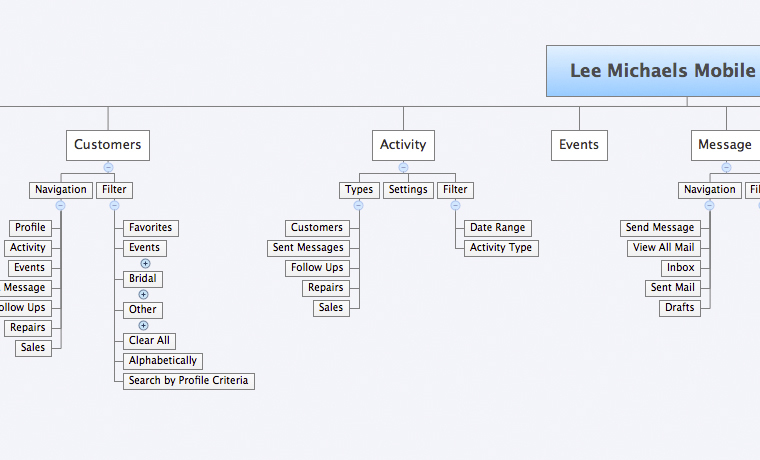 Previously, Lee Michaels had a fixed, desktop-based CRM with no mobile capabilities which meant sales associates updated customer interactions from memory at the end of the day or between customers on a handful of computers. Additionally, the CRM was missing essential functionality such as follow-up reminders, orders in progress, and extensive customer history. All of these business pains led Lee Michaels to Envoc to polish their CRM by delivering a specialized mobile solution that can be used by any sales associate anywhere in any store. 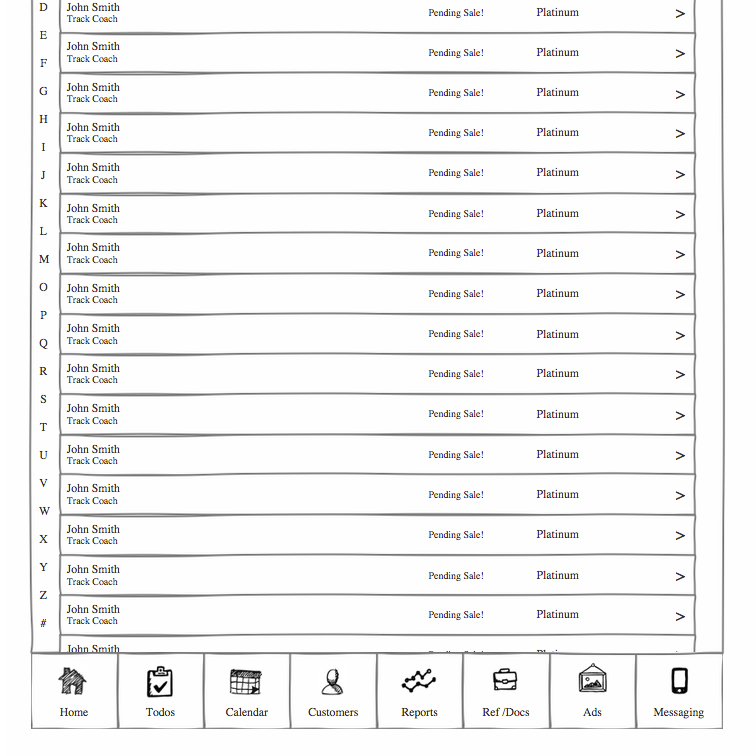 Since Lee Michaels is such a large, independent jeweler, we knew the CRM needed to be beautiful and usable by any associate. It was important to focus carefully on the User Experience design so that any of their 100 sales associates could easily use the application. From there, we made sure to exquisitely handcraft the application so that it would convey the Lee Michaels brand. Lastly, we made sure the app could be integrated with third-party applications and developed it for mobile usage specifically on iPad Minis, using the Xamarin platform to ensure flexibility for future improvements. 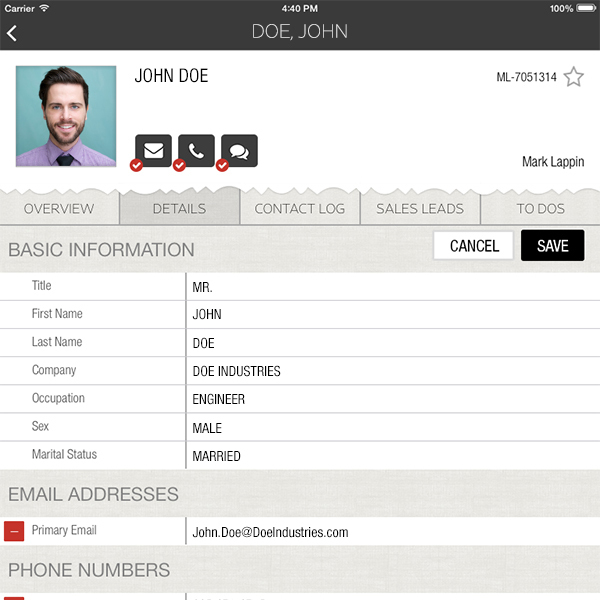 We created a custom iOS application, which the associates have dubbed “RedBook,” that allowed sales associates to have each customer’s story right at their fingertips. 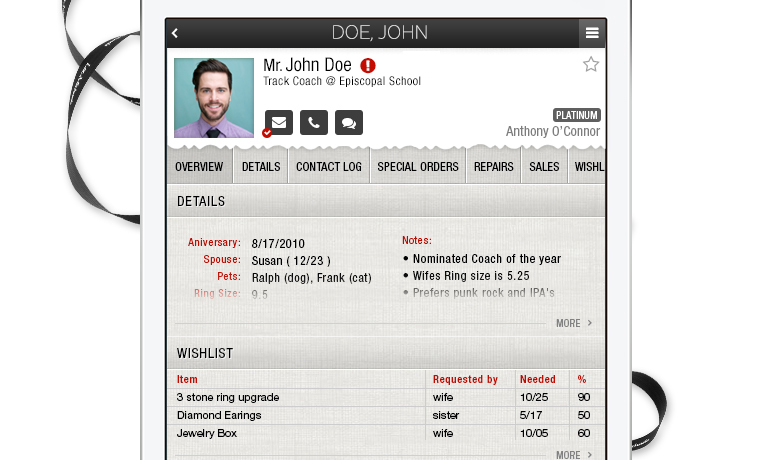 The mobile sales CRM allows the sales team quick access to tools that create a better reality for their sales process, such as sales flyers, reference materials, and individual wishlists. Additionally, the app gives reminder notifications so the sales associate can easily follow-up with customers. 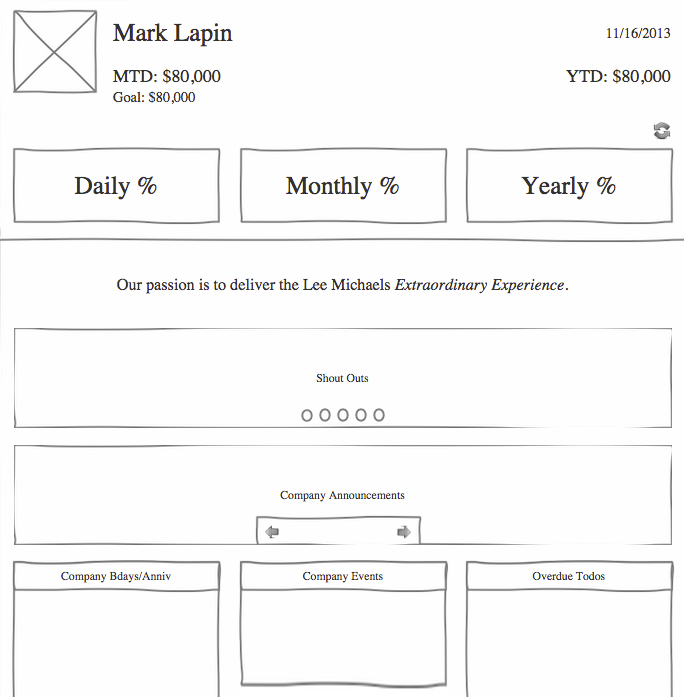 Lastly, we made it design-heavy to reinforce the Lee Michaels brand from start to finish. Now, when a customer walks into a Lee Michaels’s store, the sales associate greets them with iPad Mini in hand and in an instant can pull up a full customer history to assist the customer with repairs, ongoing sales, and even surprises for their significant others. Michelle, [a sales associate] was able to look up the client’s name in RedBook and go to ‘Sales in Progress’ where she found all of the notes on what the client was ordering, including price and finger size! I'm sure that the customer was very impressed by our efficiency and technology.